James Did It! | Gingold Theatrical Group Gingold Theatrical Group – James Did It! The Gingold Theatrical Group, under the leadership of David Staller, brought James Did It! on board to update their site, eliminate Flash animations and make it easier for them to update. The solution was to focus the valuable homepage real estate on what GTG does. 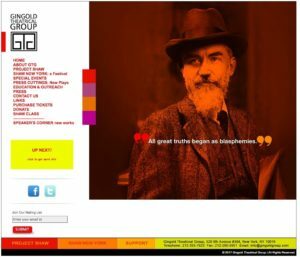 While it honors the legacy of George Bernard Shaw, the company is about so much more. As with most older websites, the old site (at left) was also not responsive. So if someone viewed the site on an iOS device, all they saw was the navigation bar on the left. The current design not only puts the most important information up front, the design changes based on the user’s screen size.